You can recycle your plastic bags! Sakai students are collecting, weighing and shipping plastic film to be recycled into TREX composite decking. 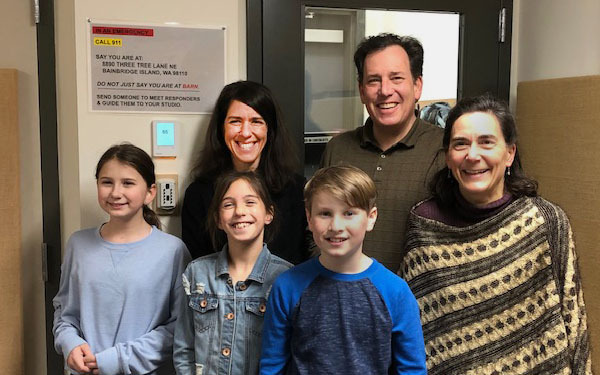 Listen here as 5th graders, Genna Albrecht, Rowan Meek, and Taylor Mass join Sakai Principal Jim Corsetti, Lead Teacher Elizabeth Vroom and Sakai PTO Enrichment Chair Kathy McGowan to tell us how local businesses like Safeway and T&C are working with Sakai students to win the TREX challenge and reduce the amount of plastic that damages our environment. You’ll learn about types of plastic that can be recycled, about the successes and challenges involved in this exciting project, and about how you, too, can get involved. Drop off your plastic film — including bubble wrap, cereal bags, shopping bags, dry cleaning bags and more — at Sakai between now and April 15. There are special bins marked TREX at the smaller entrance of the school to the left of the main school entrance. Help Sakai School students win this challenge, and reduce the amount of plastic that goes into landfills and the ocean! Questions? Email sakaipto.enrichment@gmail.com for more information. Credits: BCB host, Betsy Lydle Smith; audio editor and publisher, Diane Walker; social media, Jen St. Louis.